The MiniXP project is based on Dietmar Stoelting's XPSP1 with full commandline and NTFS below 10 MB. See here for the project homepage. Please refer also to the XPSP1 with full commandline thread (see link above). 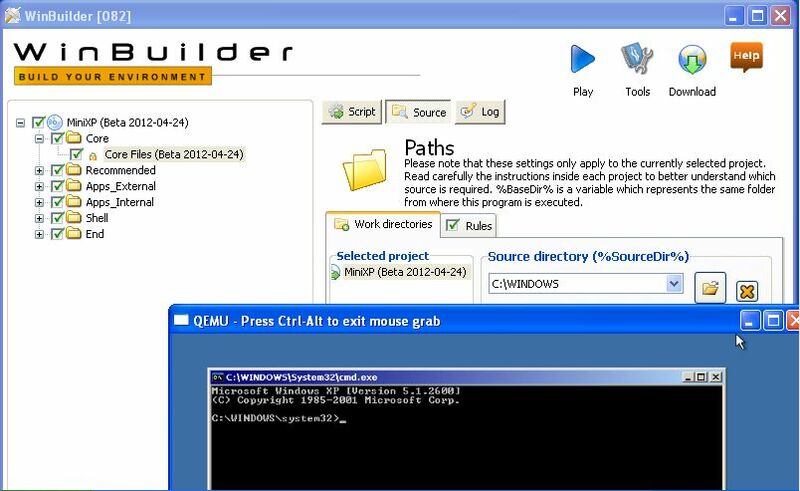 This project is a WinBuilder wrapper for one of the XP project's discussed in the XPSP1 with full commandline thread. It can be used to create a small Windows XP based installation that can be booted from a physical hard disk or a hard disk image file - RAM disks and file backed disks are supported. A Windows XP CD, I386 folder share or an existing Windows XP install can all be used as source for the project. The website and project download include documentation and instructions for using the project. At the moment I recommend testing in a Virtual Machine only - QEMU is included in the project. All this in a 4.28 MB download! This is a beta release. Please test and feedback - the more feedback the better. Test gather files from Installed Windows XP on Computer HD not from ISO nor i386 folder. Suggestion rought draft. Someone else might have a way to have a user be able to see the Html contents within Winbuilder. I dont know how. MiniXP Project files (Beta 2012-04-24). Test gather files from Installed Windows XP on Computer HD not from ISO nor i386 folder...Worked. The first confirmed report of a successful build with the latest scripts. Thanks. Thanks for the continuing support and suggestions. I was beginning to worry that your previous suggestions about including ImDisk were bordering on harassment - hope you noticed the inclusion of the option to install it in the new build. Thanks for testing. Hopefully the latest version worked with your source files. The latest build will attempt to extract all core project files from driver.cab and SP#.cab as a backup in the event of the files not being in the default places. Thanks also for the information on adding USB support for file backed disks - this is on my list of things to do and I will add it to MiniXP as soon as possible. My priority at the moment is improving the documentation. You're funny. I wouldnt be making suggesting if it would not make the other new users interested in such a quest project experience easier to follow in the now or future,future . imdisk install not available in the MiniXP Project files (Beta 2012-04-24) release. Before i forget, can you make a repository folder on the site of older minixp zip projects. Just in case in couple of months, years some one stumbles on this project and wants older reference files from one of the older zips. Since you are our resident graphical designer , what about making a bootvid.dll for the MiniXP? Do you remember the good ol' times? It's there - the option just might not be as easy to find as I'd hoped. The Link you posted is broken. Mmm! Its at the end. But the user needs it at the beginning. Just edited scripts to make show the layout. The Minlogon script was based of the script for Acronis-DiskDirector10 from LiveXP. You where ahead of me on this one. As you can remember we ended up not using them. The link is http://msdn.microsof...6(v=VS.85).aspx - the link MedEvil posted missed off the ).aspx at the end. I was thinking something like this..
ImDisk is only a requirement of the Finish script, which is why I added the option in that script. Whilst your suggestion would definitely make the option to install ImDisk more visible, it adds yet another script for the user to wade through. I'll have more of a think about the suggestions, but I want to keep the scripts (at least the one's visible to the end user) to a minimum if possible. Sort of. They were there, but I don't know when I'd have gotten around to linking to them. Other ideas....If someone adds the bblean shell to the project add the following text to the command prompt when it loads up type "shell" to launch bblean. Not sure how to do this. Will add it to the project if anyone can tell me how. I would prefer to be able to automatically launch bblean if possible, but again I don't actually know how. I tried adding all of the above files and the registry tweaks you mentioned (minus the entries for USB 3.0 drivers, which I do not have or require), but have not made any progress. After adding all of the above, the build stalled at the splash screen. The splash screen looked greyed out and did not display a progress bar. This happened when booting a disk image on an attached USB hard disk, and booting a disk image on an internal hard disk with (and without) a USB device attached. I'd prefer to be able to isolate just mass storage support initially, for those that do not require USB file backed disk support. Any suggestions. usbccgp.sys is used at USB keyboard. Not used at storage. wmilib.sys is uses at USB too. However this default driver is included already. Seems to be another issue. registry? Yep, but that was loong ago, and at the time it was about a "generic" Winbuilder bootscreen, MiniXP may "deserve" a special treatment . It should be rather easy to add it to your build. Misty, i'm not quite sure, is MiniXP what it says, a Mini XP or is it a mislabled PE1? I tryed 3 times to correct it, it doesn't take. Gave an info to Nuno about the problem. Thanks for the response. I'll continue to look into this. It's most probably a registry issue. Might be an issue with my netbook - I'll retest on another PC. BTW, does the registry need to contain entries for usbport.sys? Also are any .inf files required? It's the former - based on Dietmar's XPSP1 with full commandline and NTFS below 10 MB. It's definitely not a mislabeled PE1x. In that case, shouldn't it be easy to get the correct registry keys from an installed XP? Just search the registry for all driver files and export, what you find. Also don't forget the root entries and critical devices database, which might be linked to those drivers as well. That is an option. As both cdob and wimb have reported success with USB mass storage I'd prefer to be lazy and just use their work. What is your XP Source ? Mine is XP SP3, what you should use also I think ....and not GOLD or so. In XP SP3 you have the latest USB drivers (check the difference in date). and see if USBBootwatcher files and USB drivers are at the correct place. Try to use IMG_XPCMD.exe with XP SP3 as Source and see if USB booting works for you. USB Mass Storage is kind of working. I've tested this successfully with Service Pack 2 and 3 source files - Service Pack 1 is not working (it still hangs at the splash screen). I've not bothered testing with Gold source files, as the USB 2.0 settings in cdob's registry settings were not (AFAIK) implemented until SP1. "DisplayName"="Microsoft USB Standard Hub Driver"
"DisplayName"="Microsoft USB Open Host Controller Miniport Driver"
"DisplayName"="Microsoft USB Universal Host Controller Miniport Driver"
"DisplayName"="Microsoft USB 2.0 Enhanced Host Controller Miniport Driver"
Thanks to everyone who responded to my request for help (cdob, MedEvil, wimb and Wonko the Sane). Next step will be USB File Backed Disk support. Would also love to get this working with Gold and SP1 sources - suggestions are welcome. We are now now in the unfortunate position where diskpart is only working with Gold and SP1 sources, and USB Mass Storage is only working with SP2 and SP3. I missed this when I read your post earlier - did you edit the post? The current version is 2.7. It is released as freeware with a very liberal, BSD-style license. Looks like a very useful application. Thanks.